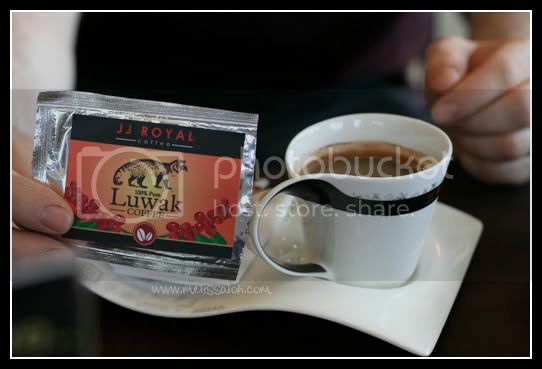 This, my dear readers, is coffee luwak. Or sometimes spelt 'kopi luwak'. This seemingly ordinary cup of coffee is not the least bit ordinary at all. At the insistence of the Sibling's beau, we hunted down a cafe in the Jakarta airport to taste this extraordinary beverage. And why is it extraordinary? Because, my dear readers, the beans this coffee is made of has been eaten, digested and pooped out of the digestive tract of a civet cat. That's right, people: we pay exorbitant amounts of money to drink cat poo coffee. omg you've actually tried it! =O How much was that cup and did it really taste that extraordinary?! Yup I tried it. USD$8-12 (depending on exchange rate). Its a strong coffee thats rather smooth and has a very pleasing aroma. tvjames seemed to enjoy it. I was a little more skeptical and decided to forgo drinking it. I'll stick to regular coffee, thanks. hrm how did it taste like thou?